LowSaltFoods.com is a resource for people who want to follow a low-salt diet. 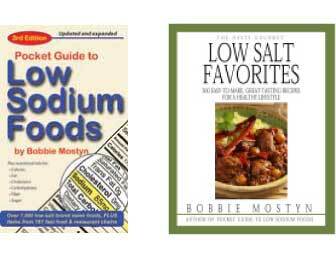 It was created and developed in 2003 by Bobbie Mostyn, author of Pocket Guide to Low Sodium Foods and The Hasty Gourmet© Low Salt Favorites, and InData Group, Inc., publisher. I was diagnosed with high blood pressure in 1999 and told to watch my salt intake. I was determined to find out all I could about hypertension and what I could do to keep it in check. For decades I took pride in preparing healthy meals . . . or so I thought. I sought out low-fat foods, used whole grains, limited meats to poultry and fish, and even threw away the saltshaker years ago. Little did I know that my “healthy” diet had been filled with sodium and other foods that contributed to the rise in my blood pressure. When my doctor suggested I start reading labels, I was amazed at the amount of sodium my husband and I were consuming. One of our favorite healthy meals was a garden salad with lots of veggies, fat-free cheddar, and fat-free Italian dressing… it came in at a whopping 1,120mg of sodium! And that’s before we added a slice of whole wheat bread and margarine (which is a couple hundred more). I couldn’t believe it! When I added up my daily sodium consumption it averaged more than 3,500 mg a day . . . way too much! In an effort to help others who need to reduce their sodium consumption, I published my 2 books and developed this website. I hope it is helpful to you and that you will tell your friends and healthcare providers about our books and website. Here’s to good health and following a low-sodium diet!